Bryce Harper is no longer blond. Seth Lugo is. Was there any question who would come out on top? The same question, I suppose, can be asked about Trea Turner, and Ryan Zimmerman, and all those infernal Nationals who got to Seth and our subsequent pitchers on a day that clearly was not ours. Our seats today were in the first row, right behind the Nationals’ bullpen: I was there as Max Scherzer warmed up. Everyone nearby could hear him grunting as he tossed. Scherzer was going all out. It showed. The family of Nationals’ fans next to us were pleasant seat mates, at least as far as Nationals’ fans go. They were two parents and a daughter. Early on, between innings, I was nearly nailed in the head by Bryce Harper as I scrolled through twitter. The throw was meant for the daughter — allegedly. I suppose you can’t hate a player who gives a kid a ball, close as it came to denting my cap. When Travis Taijeron broke up Scherzer’s bid for a Spring Training no-hitter, I mused to my friend that this Spring Training was probably the first time we’d ever had two players named Travis in the same lineup. That theory remains unconfirmed. What I can confirm absolutely certainly is this: the other Travis, d’Arnaud, might as well not have been there. Even from my seat, I could clearly see, on multiple occasions, the ugliness of his swing. But then again, it was a bad day for everyone — we all have them. The later innings were a who’s-who of vaguely familiar names from the reaches of our farm system — Desmond Lindsay, Luis Carpio, Andres Giminez, Grant Cone, David Roseboom. They fared hardly better than the regulars. A Tim Tebow strikeout sealed the deal, also regrettably ending what had the chance to be the most dramatic home run in a 6-0 Spring Training game of all time. My friend and I were happy as we crossed the parking lot, walking back to our hotel. “That’s what I love about Spring Training,” he said. “When you lose, you don’t really feel bad.” Need I write a better ending than that? When we got to our hotel last night, we entered an empty lobby to find a Mets-shirted employee behind the front desk. It was then, give or take, that I knew our trip would be a good one. There’s a Matt Harvey Fathead in our hotel lobby. You don’t see that too often. My friend and I both took pictures with it. I’ve got a Matt Harvey Fathead in my room at home, but this is different. Arriving at First Data Field this morning to see the real Matt Harvey, my first impression was surprising, even to me. It reminded me of Shea. I couldn’t tell why, and I said as much; my friend agreed with me, in that he couldn’t tell why either. Maybe it’s just an intuition thing. That building’s been around since 1988. Keith and Carter played there, as did Doc and Darryl. People played in that building who played with people who were playing in 1962. 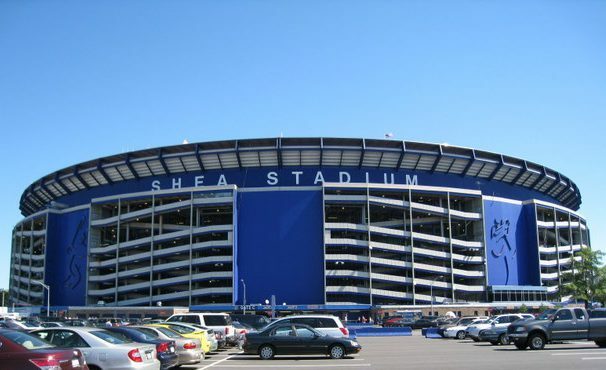 It doesn’t seem like much, but since Shea closed, First Data Field — albeit under several different names — is now the oldest home ballpark the Mets have. Could I feel that in the air as we approached? Maybe. Then we got inside, and I saw exactly what reminded me of Shea. If you’ve been there, it’s obvious. The concourses are narrow; maybe ten feet wide, not at all meant to handle a crowd. The lines at concession stands spill out into the crowds walking by. The seats are too small; they don’t do that thing Citi Field does where they angle towards the infield; you can tell that the place was built before comfort became all the rage. Did I care? Not much. Actually, I thought it was pretty nice. Some things go beyond comfort, and reminding me of Shea is one of them. We took our seats, in the back half of the stands behind first base. Around us, on each side and behind, sat a family, composed of a son at his first baseball game, a father making loud noises, several women who may have been from Atlanta, and a grandfather who was very interested in discussing the game with me, if not entirely knowledgeable about how it went. He asked me where Tim Tebow was, and who was that guy on the mound. Wilmer Flores, he told me, would hit if he ever just learned to hit the ball. “Because seven eight nine,” one of the women responded. The two women, when they weren’t having blatantly counterfactual conversations about the Subway Series (“we went a few years ago, I think it was when they first started it”) or Tim Tebow’s whereabouts (“this is the minors, but I think they sent him under the minors because it’s his first time playing baseball”), talked to the child about fandom. At some points, they almost made me cringe. Matt Harvey, meanwhile, was a show all by himself, even as he pitched well but not spectacularly. Any experienced baseball fan will know the feeling of hearing the crowd make a collective noise; a shout after a bad call or a yell after a ball clears the fence. Today, as Harvey pitched, the crowd was making a different kind of collective noise. With each pitch he delivered, through at least the first few innings, you could hear the crowd looking breathlessly at the radar gun in center field, then murmuring about its reading. When Harvey hit 97 in the first inning, whispers of “ninety-seven!” ran through the stands. That was the only time he threw that hard. But he looked fine nonetheless. His velocity was up and down — but up is the important part, because after it went down, it came back up again. Harvey was still throwing hard in the fourth, and managed to pitch through the sixth. One of his two runs, as a matter a fact, should never have happened; the catalyst, a pop-up, fell between three players that all thought the others would catch it. We were down 2-1 in the bottom of the fifth when Jose Reyes decided to show flashes of 2006. He drove a liner into the right field corner, just like he did some time back in ’06 or ’07 at Shea, the first time I remember doing the “Jose” chant myself. “Three!” I was shouting as he rounded first. He knew it. He was in there, and Kevin Plawecki had scored. A few pitches later, Cabrera drove Reyes home to tie the game. We kept scoring, and pitching, and eventually, I found out that I was intimately familiar with the Mets’ spring training roster. This happened in the seventh, as Kevin Plawecki doubled and left for a pinch runner. I thought it was Patrick Biondi; I swear I did. So when I heard that Dale Burdick had scored, I was almost shocked. There are all these little moments, when you’re watching a game in Port St. Lucie, that remind you you’re not at Citi Field. At the seventh inning stretch, they played “Take me out to the ballgame,” but didn’t display the slightly modified Citi Field lyrics on the scoreboard to go with them. Apparently, chanting “root, root, root for the Me-ets” isn’t something people do if the scoreboard doesn’t prompt them. It was strange to watch, let alone hear; it’s the first time I’ve ever heard that line of the song, not followed by a confused murmur of thousands of fans unsure of what to say. We kept hitting, and we kept hitting, and we kept hitting — besides catcher Jeff Glenn, who reminded me of Valentino Pascucci in the on-deck circle, and who thus earned a home run call from me, before popping up to the Braves’ catcher — and eventually, Josh Smoker was pitching to close it out. Smoker had two strikes on Adam Walker, when the sun, which had gone in behind a cloud, came out again. It probably would have meant something, if the sun had shined on the last pitch of the game. The sun was rising just as the game was ending; the clouds over Opening Day were departing, something like that. But it wasn’t. That perfect ending just wasn’t there. Smoker threw a few more pitches; Walker fouled them off. Smoker got the strikeout eventually — but it wasn’t quite the storybook, sunny-last-pitch ending that a writer might have written. Eh. Ah well. Baseball doesn’t have to be perfect; it rarely ever is. Often, it’s enough for it to simply be there. Perhaps you’ve noticed that the heralds of Shea Bridge Report haven’t been bearing much news lately. I have myself, and before going any further, I must say that there are a few reasons for this. For one, my writing energies lately have been occupied with an academic project, or to be more precise, a 5,000 some-odd word feature on a college baseball player you’ll see, more likely than not, signing a professional contract around draft time. I don’t know whether you’ll ever read this feature; just as it could appear nationwide in a week, it may never see the light of day. Lots of fun to write; just as much fun to read, from the limited feedback that I’ve received; inconsequential to the Mets either way. For another, there just hasn’t been much going on that I haven’t already said. My Spring Training reservoir of creativity is pretty much tapped out; there’s only so much you can say about ballplayers congregating in Florida in February and March that you haven’t said the year before, or in a different media outlet, or to others in person. You can capture the energy; the nostalgia; the history; the sun. But you can’t do it so many times, or every day. It gets old eventually, like girl scout cookies or David Wright, who you likewise can only capture in writing so many times, as I’ve learned from experience. So when you combine all the factors, the schoolwork, the absorption in hitherto unknown personal endeavors, the simple lack of anything new to say about things that are barely happening, I simply didn’t see a new post coming down the wire. But maybe that had something to do with what the month was building to. Because starting tomorrow, I see posts coming, daily or more, for a few days at least. As of a few hours and a long cab ride ago, I’m in Port St. Lucie, within walking distance of First Data Field, tickets to our next three games in hand and a new Spring Training jersey in my suitcase. I’m still in need of sunscreen; what I’m no longer missing is Mets baseball to cover. So starting tomorrow, tune in daily or on some basis close to that, for Dispatches from Spring Training, parts one, two, and three. Opening Day is coming up — but that doesn’t mean things can’t happen in the meantime. In a small leather notebook on a shelf next to my bed, I keep a list of every Mets game I’ve ever attended, along with its score, the starting pitcher, and the opponent. The list is currently 82 games long, which, depending on who you are, may seem like a few or a great many. Let’s just settle on a fair amount. I’ve seen my share of the Mets, you might say, and my share figures to continue increasing fairly regularly on an annual basis. However, I’ve never seen Phillip Evans play. So all of you watching were just as surprised as I was when, an 0-1 count on him in the bottom of the fifth, he took a swing and cleared the bases. It was a classic Spring Training home run, out onto the space between the fields, above the Nathan’s billboard but below the tops of the palm trees. Evans had another hit later, and another RBI. He’s batting .375. Speaking of .375 hitters, Yoenis Cespedes hit one as well, but this one was no classic Spring Training homer. This one was tall, majestic, heroic, colossal. It cleared the batter’s eye in center field and kept going; no one’s quite sure where it ended. Unlike Phillip Evans, I’ve seen Cespedes in person more than a few times, enough to know that this is the norm and not an exception. You know who else once cleared the batter’s eye at First Data (née Tradition) Field? David Wright. Like Cespedes, I’ve seen Wright more than a few times, but unlike Cespedes, I’ve seen Wright far more. This was back in Spring of 2015, when we thought Wright had already been through enough injuries to last a career but were blissfully unaware that those damn impingements were just getting started. They were wearing the old Spring Training jerseys, the ones with the patches under the arms, and while it might just be my imagination, Wright looked bigger, stronger, more imposing at the plate. And you can’t blame him; the man’s been through enough surgery to kill a pack of junior mints. David Wright doesn’t have a Spring batting average, or if he does, I’m not sure what it is — .250, maybe. It barely matters either way. David won’t play again for a while, which could mean anything from a little while to a real while, but either way, is too long. He’s got a shoulder impingement, which is likewise meaningless in the sense that no one seems to have any idea what it means or how it works, but deeply meaningful in that it will keep a man who loves baseball more than anything off the field. So if David can’t play, who plays in his place? Maybe Jose Reyes, who was once Wright’s partner for life, in the baseball sense. It doesn’t get much closer than young shortstop and young third baseman growing up together. Reyes didn’t have a hit today; he’s batting .200 on the Spring, which doesn’t look great until you consider that, well, it’s Spring. I don’t suppose Terry was considering Jose’s performance when he pulled him for Phil Evans, who promptly hit a grand slam, not that he’s after a job. Or, will David’s replacement be Matt Reynolds, another .375 hitter? Reynolds hit the ball well today; he drove an RBI double to the right field gap — even looked something like David Wright. You remember the way David used to drive the ball in the gap like that…like it was nothing! It wasn’t nothing, it seems; it was far more than nothing, something that over time adds up until it manifests itself as a series of injuries, one after another. Not that this will happen to Matt Reynolds, after all…he’s batting .375! Suddenly Brandon Nimmo enters the picture, because we’ve got three .375 hitters, and Brandon Nimmo is getting hits more often than any of them. Nimmo was three for three, including being thrown out at second trying to turn a ball off the first base bag and into right field into a double. Watching, I was for a split second, just a split, reminded of Daniel Murphy, and the play he made in 2009, flipping to Bobby Parnell for the out. What’s Murph up to these days? Well who knows? But his replacement is doing fine, as we saw when Neil Walker knocked a two-run homer onto the “berm,” if that’s what it’s really called, in right field. I thought Walker had more power from the right? Wait, I thought Walker had more power from the left? Who knows? Today he had lots of power from the left — tomorrow, we’ll see when we get there. You know who didn’t have such a positive performance from the right side of the plate? Adeiny Hechavarria. When his bat went flying out of his hands following a weak swing at a stronger Robert Gsellman fastball (they’re calling him “Rob” now — is that going to stick? ), I almost gasped. Watching the replay that showed Luis Guillorme making the play on the bat, not the ball, I nearly gasped again. Luis Guillorme had five twos in his batting line today; three from his batting average, one for the two men he left on base, and one for the two at-bats in which he failed to record a hit. Add all those twos up; that’s the score the judges sent down for his play on the flying bat. It all evens out. Oh, one thing is certain — the energy of Spring is in the air. Everyone’s doing something, from the bat-catching Guillorme to the .545-hitting twins Gavin and Travis to the ice-machine-wearin’ trio in the booth; down in Florida the sun is shining and the breeze is blowing; the pitchers are throwing and the hitters are stretching; the scouts are watching and the manager’s laughing; the gloves are popping and the bats are mashing; the ball is zipping and the cleats are sliding; the grounds crew is watering, the umpires are barking, and the fans are cheering; and together they’re all shouting the same thing: Coming soon to a ballpark near you — baseball! It certainly is. Come on now — who doesn’t love Spring?